There has been a change of thought in recent years regarding the best mix of investment options to offer within company retirement plans (401k, 403b, etc.). For many years, the trend was to add more fund choices. Recently, many companies have started moving in the opposite direction, offering a declining number of investment options. This change is based on research indicating that as the number of choices goes up, the effectiveness of employees’ decisions goes down. So companies have been limiting options, as well as steering employees toward broad-based index and “target-date” funds. While limited choices may be best for the average worker, this trend is not the friend of SMI readers, who typically benefit from having more options. The good news is more plans are offering “brokerage windows” within their plans (roughly one-fourth of plans now offer one). But if you’re one of those stuck in a plan with no window and relatively few choices, don’t despair. SMI’s Personal Portfolio Tracker makes it easy to maximize the options available to you. SMI’s Upgrading strategy normally involves selecting from more than 1,000 stock funds spread across five asset classes (or risk categories). But if your 401(k) plan offers only a small number of funds, it’s not likely you’ll have a strong-performing fund available to you in each of the five categories. For those in that situation, we’re about to discuss an alternate approach to Upgrading. Before getting to the explanation, however, we want to point out that this approach involves a trade-off. You’re going to give up the relative stability you enjoy when you diversify across all five of the major stock-risk categories as we normally recommend. What you gain is the freedom to select the best performing funds available, regardless of risk category. Depending on which funds are offered in your particular 401(k), you could conceivably end up having all your money invested in just one or two of the risk categories (in small-cap growth funds, for example, or perhaps foreign funds). Concentrating your investments in only a couple of categories raises your risk. So it’s very important to check your fund holdings each month and follow the selling rules faithfully. If you’re heavily invested in an asset class that begins to fall significantly, the system will automatically move you to funds that are doing better. But “user error” can undermine even theoretically sound systems. Your selling discipline is your life preserver. Use it! To determine the best way to approach Upgrading with a limited number of funds, we created a hypothetical example using the stock funds at a single fund organization — Fidelity. We assumed an investor had a 401(k) account with access to all of Fidelity’s actively-managed stock funds (we started with 42 funds and it gradually increased during the test period). The results from Upgrading in the manner described here, shown in Table A at right, outperformed the market in nine of the past 14 years, and would have added significantly to an investor's returns over the period as a whole. All of the diversified, actively-managed stock funds offered at Fidelity were assumed to be available. We did not consider any money-market, bond, or hybrid funds (combination of stocks and bonds). Each month we checked the updated momentum scores for the stock funds in our Fidelity 401(k) portfolio by simply clicking a button in the Tracker that generates a monthly “momentum view” report. Initially, we bought the four top-ranked funds as shown in the Tracker report, regardless of risk category, dividing our stock allocation equally among them. Each month, we generated a new report and checked the momentum rankings. We held each fund as long as it remained ranked in the top 12. 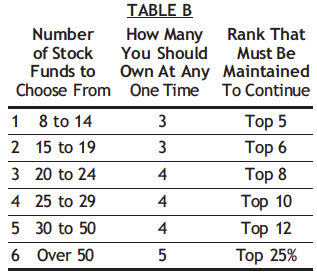 The “top 12” criteria were based on the number of funds available to us as shown in Table B below. We devised the table with the idea of eventually using the top 25% cutoff (as we do in regular Upgrading) as the number of available funds in a 401(k) grew. The numbers shown in the table for six possible scenarios admittedly are arbitrary, but they felt “right” as we considered how the strategy would play out in real time. 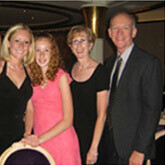 You can adjust the number of funds in which to invest if it seems appropriate to you to do so. When any fund dropped out of the top 12, it was sold and the proceeds were invested in the highest-ranking fund we didn’t already own. The only exception was that we never owned more than two foreign funds at any given time. During the occasional periods when foreign funds dominated the rankings, this required extending the cutoff from the top 12 to the top 16 in order to have at least two U.S. funds in our mix. We rebalanced annually so that we would begin each year with equal amounts invested in each of the four funds. Our readers participate in thousands of 401(k) plans, most of which have different lists of funds from which to choose. So, it’s impossible to generalize with confidence concerning the degree of success you might expect when applying this research to your specific plan. Still, the backtesting results obtained are encouraging, and signify to us that if you have at least a few strong performers among your list of options, you have a good chance of getting market-beating results. Bear in mind, however, that a higher level of risk will accompany those results due to over-weighting in only one or two of the five stock-risk categories used in regular Upgrading. The overall excellence of the Fidelity test results, outperforming the market 7.1% to 4.2% annually over the past 14 years, obscures some occasional volatility. As Table A shows, in some years the added concentration may be especially helpful (e.g., 2005 and 2007); other years it can hurt (e.g., 2008 and 2011). Overall, the good likely will outweigh the bad if you stay the course. Given that this approach is most commonly applied to long-term retirement investments, most readers can afford to be patient and let the system work over time.